The holiday shopping season seems to have arrived, and it’s time to start thinking about what to get the birder in your life. Here are some of my picks for this year, based on what I’ve received myself and what I’d like to get! I’m a women’s size small, so finding bird-related clothing that fits me well used to be a challenge, until Paul Riss at PRBY Apparel in Ontario started designing very artful, well-designed, clothing in a range of sizes, not just unisex. My favourite birding pieces are the Snowy Owl toque (which my mother got me last year for Christmas) and the Gray Catbird t-shirt. 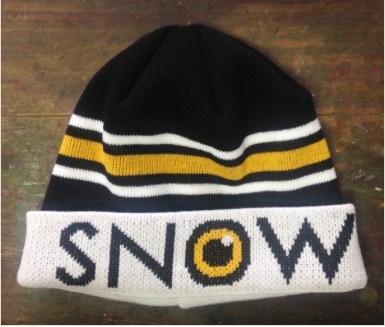 If you’re looking for some cool birding apparel, head over to the PRBY Apparel website. One of my favourite yearly gifts are birding/bird photography calendars. My mother usually gets me a calendar by David Sibley, but this year I’ve ordered one from Calgary photographer, Daniel Arndt. Daniel writes at the Birds Calgary blog and is an amazing photographer. 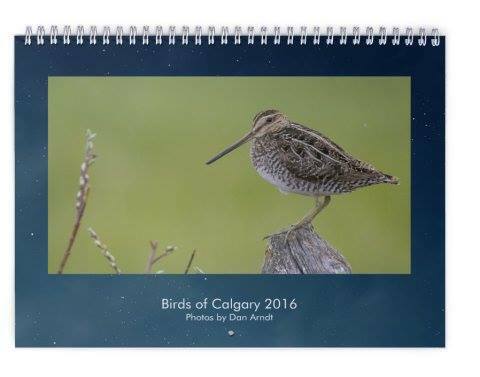 If you’re interested in a calendar and in supporting a local birder, visit Daniel’s Facebook page or email him at birdscalgary AT gmail DOT com to place an order. 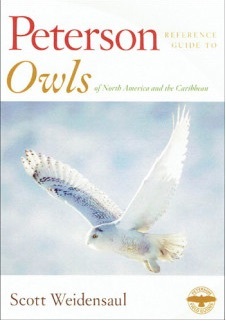 In October, the Peterson Reference Guide Series released a new guide by Scott Weidensaul, covering all 39 species of owls in North America, Mexico, and the Caribbean. The Peterson Guide to Owls is an extremely comprehensive guide with 340 colour photos of every species. It features information about ID, habitat, calls, nesting, behaviour, and very accurate range maps. This new book was one of my first holiday presents this year, thanks to Ray Brown! Speaking of Ray, his radio show Ray Brown’s Talkin’ Birds got me hooked on Droll Yankees bird feeders. This past spring and summer I put out a Droll Yankees Hummingbird Window Feeder which attaches to the glass with suction cups. The Ruby-throated Hummingbirds visited the feeder all through the summer and seemed to prefer that feeder over the one in front of the house. This would make a perfect gift for anyone who’d like the chance to learn more about birds and birding, and it’s great for kids. Artist Louise De Masi has some really lovely and accurate watercolours and acrylic bird prints and paintings in her Etsy shop. She’s an Australian artist and while many of her pieces of Australian birds, a number feature North American and European birds as well. 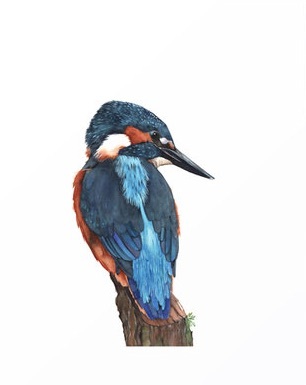 This European Kingfisher is one of my favourites as it reminds me of the ones I saw in France earlier this year. For birders wanting a “compact” and more portable version of The Warbler Guide by Tom Stephenson and Scott Whittle, check out the Warbler Guide app which has all the information from the book plus more. 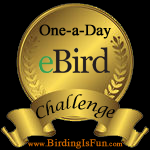 The app is a terrific for birders who love warblers. You can purchase it at the App Store, or give a gift card for the iTunes Store or Google Play. 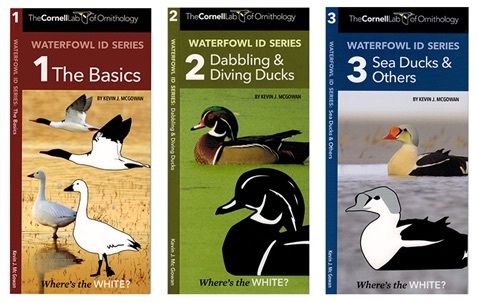 The Cornell Lab of Ornithology has developed a new pocket-size waterfowl ID series, centred on picking out patterns of white and dark in common waterfowl and duck-like birds in North America. The three laminated foldout ID guides — The Basics, Dabbling & Diving Ducks, Sea Ducks & Others — focus on identifying waterfowl based on the overall shape of the bird and where the patches of white are located. The foldouts are $7.95 U.S. each, but if you purchase all three, shipping is free from The Cornell Lab’s Store, Wild Birds Unlimited at Sapsucker Woods. Colouring books for adults are all the rage now, and Ontario birder and artist Sarah Rupert has created two colouring books — Warblers and Owls. Each book has 20 pages to colour, and features 21 species of wood warblers and Great Gray, Snowy, and Eastern Screech Owls. You can find her colouring books and other works of art at her Etsy store. Gift memberships to Bird Studies Canada, the Cornell Lab of Ornithology, the American Birding Association, your local naturalist society, or any other birding/nature group make for a great gift. With all of these groups, you’ll join a community of like-minded people, receive various publications and exclusive member information, and you’ll also be supporting a good cause. 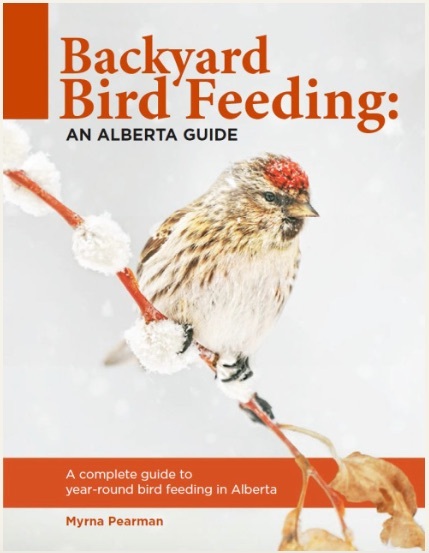 I’m thrilled to announce a giveaway for the new book Backyard Bird Feeding: An Alberta Guide by Myrna Pearman. Myrna is a nature photographer and writer, and has been the biologist and site services manager at the Ellis Bird Farm near Lacombe, Alberta, since 1986. All the proceeds from the sale of the guide go to support programs at the Ellis Bird Farm. I’m honoured to have a photograph in the guide — my Northern Shrike picture on page 57; anyone with a photo in the guide received a complimentary copy. When I was emailing back and forth with Myrna earlier this fall, I asked about the possibility of a copy to give away on my blog, and Mynra very generously sent along a second one, also autographed. For a second entry, head over to my Facebook page Prairie Birder as well as the Ellis Bird Farm’s Facebook page and “Like” them both. For a third entry, use the hashtag #BackyardBirdFeeding on Twitter. For a fourth entry, share my original post on Facebook (linked here) to your Facebook page/wall. Please mention below in your comment that you have “Liked”, shared, or tweeted (if you’ve already liked our pages, that still counts). I love watching The Rick Mercer Report on Tuesday nights, so when I found out that Bird Studies Canada (BSC) was going to be on the show I was very excited. Bird Studies Canada is a very special place to me, doing work I consider very important, so it’s wonderful to know that more people will learn about this wonderful organization and its staff. From left, Steven Price, Rick Mercer, Jody Allair, and Stuart Mackenzie at Bird Studies Canada, Port Rowan; photo by Elaine Secord. For those who don’t know about The Rick Mercer Report or its host, Rick Mercer is a Canadian satirist, author, and television personality. The show, on CBC (Canadian Broadcasting Corporation), is in its 11th season, and we try to watch it every Tuesday. The Rick Mercer Report crew visited the Bird Studies Canada headquarters in Port Rowan, Ontario for a tapping on October 25th and 26th. Rick met President of BSC Steven Price and my friends Jody Allair and Stuart Mackenzie, who showed him around and introduced him to all the great conservation projects BSC is involved in including the migration monitoring research at the Long Point Bird Observatory (LPBO). From left, Jody Allair, Rick Mercer, and Stuart Mackenzie at Bird Studies Canada, Port Rowan; photo by Elaine Secord. Jody, BSC Biologist and Science Educator, was the main guide for the day, showing Rick and his crew around and talking to them about bird research and conservation – and some aspects of what BSC does, and why. The RMR crew also spoke with BSC’s president Steven Price about Bird Studies Canada and conservation. And Stu, LPBO Program Manager, was co-leader for the portion of the visit where they learned about migration monitoring. Vortex Canada generously donated a pair of Viper HD binoculars to Rick, who didn’t have his own pair. Stuart Mackenzie and Rick Mercer at the Old Cut banding station in Port Rowan, looking at a White-throated Sparrow; photo by Elaine Secord. The visit will air on the The Rick Mercer Report on CBC-TV, Tuesday, December 1st at 8 pm (8:30 NL). If you can’t watch the show on Tuesday, you can catch it online following the broadcast by visiting The Rick Mercer Report’s YouTube channel. The White-winged Crossbills were around our neighbours yard again. I’ve been digiscoping more than I’ve been using my Canon camera but the crossbills were just so co-operative that I got my camera from the truck to take a few photos. I visited our neighbours’ yard earlier this week because they have excellent habitat for winter finches — lots of mature conifers and fruit trees. There were some White-winged Crossbills flying over, and they landed in the spruce trees near the house. The crossbills were at the top of the spruce trees prying open the pinecones. An individual crossbill can eat up to 3,000 conifer seeds a day. It takes a huge amount of seeds to feed a large flock of crossbills, so they move to wherever food is plentiful throughout the year. A male and female White-winged Crossbill, Did you know that lower mandible crossing to the right is approximately three times more common than lower mandible fix crossing to the left. Next time you see a flock of White-winged Crossbills, check to see which way their bills cross! The undertail of the crossbill, I’m hoping that the crossbills stick around for a while longer since I’d like to get some better photos of them, and count them during the Vermilion Christmas Bird count on December 19th!